The Metro system has been a refuge for homeless people for decades. But as Los Angeles County’s homeless population has surged, reaching more than 58,000 people last year, the sanitation and safety problems on trains and buses are approaching what officials and riders say are crisis levels. People looking for warm, dry places to sleep have barricaded themselves inside emergency exit stairwells in stations, leaving behind trash and human waste. Elevator doors coated in urine have stuck shut. Mentally ill and high passengers have assaulted bus drivers and other riders. 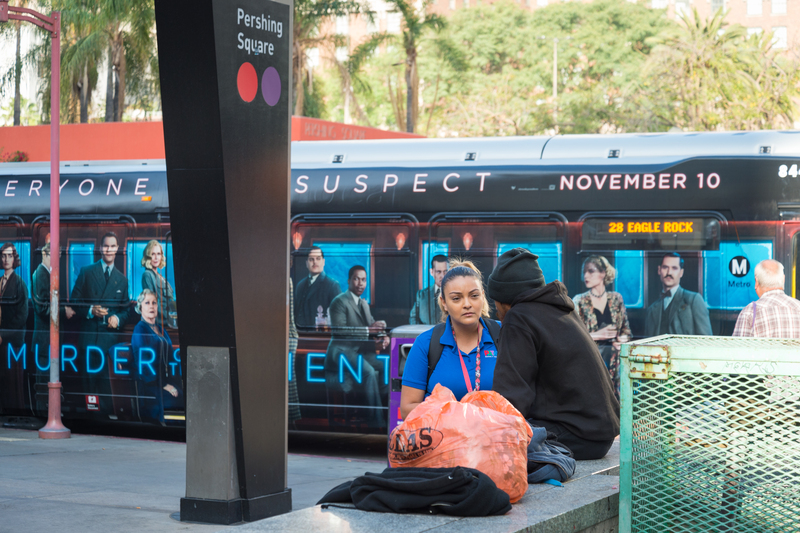 Amid a wave of complaints about homelessness, the Metropolitan Transportation Authority has bolstered spending on law enforcement and security by 37% this year. But the agency is testing a different approach, too: social workers on the subway. Under a one-year, $1.2-million contract — one of the first of its kind in the country — outreach workers spend five days a week on the Metro Red Line, trying to help the system’s homeless riders. It’s a much longer article and I highly encourage you to give it a read. I would also like to know how you think it jibes with your own experiences riding Metro. The outreach teams, btw, are working on the subway because it’s Metro’s highest ridership line and is entirely sheltered from the elements. KPCC’s AirTalk also aired a segment Friday featuring Laura Nelson and Metro’s Alex Wiggins (he’s the agency’s Chief of System Security). Listeners phoning into the show, as expected, had plenty to say. You can listen here. A worker with PATH working outside the Red/Purple Line Pershing Square portal last fall. Photo by Steve Hymon/Metro. contact with 2,420 homeless individuals in the prior 10 months. Of those, 252 had been connected to housing resources, 238 to shelters or transitional housing and 22 into their own home. The Metro Board of Directors had a lengthy discussion about the agency’s homeless outreach efforts at their March Board meeting. You can listen here — click on Item 14 to go straight to that discussion. Below is a presentation given at the meeting. Finally, I’ll say this: I don’t think anyone believes homelessness in our region is an intractable or unsolvable problem. But it has also been an extremely difficult issue for many decades that has many root causes, including one that we literally can’t solve: pretty good year-round weather. It probably doesn’t make it any easier that we live in a region with six counties and hundreds of cities, none of whom really have the financial or mental health resources that would be ideal for dealing a problem of this magnitude. Our Metro system is part of the region and will to some degree always be affected by things happening in the world around us. I don’t write that as an excuse, but as something I think is a reality. The homeless became an “issue’, if memory serves me, when then Gov. Ronald Reagan closed many state mental health facilities in the desire to balance the budget on the backs of persons who tended not to vote–their residents. This was supported by the GOP based on the belief that new “pills” were in circulation that could make the mentally ill self-sufficient at reportedly big savings to the budget. Of course, these meds didn’t work as well as promoted and many folks with mental issues could not be trusted to take their meds as well. Moreover, with its usually mild climate, Southern California has been a home for the down and out since at least the days of John Steinbeck’s “Grapes of Wrath.” So METRO’s desire to add social workers to the mix seems like a move in the right direction, although it remains to be seen if it is too little too late. The state government started the problem and I think METRO should lobby it for big money and direction to solve it—the weather, well hopefully, we will still have that. I can see how it would be too expensive to have workers at every station around the clock, but has Metro considered doing it part-time or only at selected stations? I’d imagine there isn’t the same level of concern at each stop, and social workers would be more needed in the hours after shelters have filled up for the day. As a former RTD Bus Operator and RTD/MTA Supervisor it’s my opinion the agency has added to the problem. As Bus Operator I worked primarily on the 4 Line at night and had regular homeless riders. Most of these homeless riders were clean and there were few problems with them. And most of them seemed sane but did not have a place to stay and were not seeking one on a continuous basis. There is still one man I see from time to time and although he has lost both legs due to diabetes he remains homeless because he does not like being indoors. Then there are the other group of homeless that are apparently mentally ill and extremely unkempt. I encountered many of these individuals as a Supervisor after receiving a call concerning complaints of their offensive odor. This is where the problem arises. It has been the MTA policy that these passengers can not be denied service nor ejected from a bus due to their condition. Of course the homeless see the MTA as a perfect refuse from the elements and a place to sleep but should the MTA be encouraging it, I think not? As a Bus Operator I never had a problem allowing the homeless to ride back and forth with me each night until I pulled in. They paid their fare and just slept on the bus. As I Supervisor I never stopped a Bus Operator from doing the same. The City of Los Angeles, the County, State and Federal governments all have vacant facilities that could be used but haven’t. They have collected additional taxes to address the issue with no visible results except new bureaucracies. It’s time for the VA to open it’s unused buildings at the VA campus in West L.A. to homeless veterans to begin with. They may not be modern and pretty but they can provide a roof over our veterans heads. It’s a good article. Metro is taking a step in the right direction. I would like to see the stations cleaned more often. The Civic Center station, for example, could use a steam cleaning every day. At the top of the escalator it always reeks of urine. It’s one thing to build a system, it’s another to properly maintain it. I agree with all the comments, especially those from fine7760. For the most part, homeless people riding the train or bus isn’t a problem by itself. It’s the very smelly ones. One smelly person can fill an entire LRV with stink, sometimes intolerable stink. That’s like up to 100 people during rush hour. I would support any program which includes (a) readily-accessible showers for the homeless, coupled with (b) a policy forbidding aggressively smelly people from riding the bus/train. Yes Tom Savio, the problem did start when services for the indigent and mentally ill were eliminated. And ‘tax reform’ (Prop 13) made it next to impossible to support such programs in the future. It’s about time we as a state fix the problem. Hopefully the massive tax/bond measure LA County just passed, to end homelessness, will have some effect. I ride from Azusa to Pasadena and back each day. Most days there’s no issue until you get to Lake Station and people who are panhandling gather at the intersection of the 210 fwy and Lake Avenue. The Lake Station is often littered with trash and the stairwells smell of urine. I won’t even go near the elevators. Since their is little enforcement of fare collection, why wouldn’t transients hop on the train and ride to the end of the line? I think it’s great that Metro is hiring social workers to intervene with the homeless population attempting to make trains and stations home. Enforcement and outreach need to go hand in hand. Question…when a social worker makes contact, what is the next step if the individual refuses assistance? When we we all living in the bush, one’s odor in the breezy outdoors was not such a problem, I imagine, at least they say it kept the lions at bay. But in urban areas something must be done. Of course, if you don’t like it here, I would stay clear of the Paris METRO in the summer where using deodorant is only a “suggestion” like stopping at red lights. See, this is not just LA METRO’s problem alone. There must be studies out in the Cloud that tell what other cities have done on their systems around the world. We need forward thinking on this. If METRO wants to hire young “interns” for the summer, rather than the adult homeless, then set them the task of running down this issue and possible solutions world wide. I realize that I may have taken a more extreme approach as indicated above, but for me, it was about taking care of myself first, so that I could take care of everyone else. There is no “sick time” or “worker’s comp” as a result of exposure to what some people bring on the bus. I was never rude about it. I simply stated what I expected. I’m sure that, since then, work rules have changed. Management with many transit companies are now believing the extreme stories that bus passengers have reported to the respective Customer Service departments. Usually, the issue is very minor, but the passenger will exaggerate the way they were treated. For me, thank goodness for transit systems placing camera systems on the buses! No bus operator should fear the cameras if they’re doing their job correctly. The camera systems at another transit system showed how much passengers exaggerate their claims. Social workers might be a good idea, but I think Metro needs to have stronger laws/rules about vagrancy and loitering on Metro property. If the homeless do not want help from the social workers, they need to be told to move on. Repeat offenders will need more punitive measures. I know that if they don’t have money, they certainly can’t pay a fine. Perhaps suspending their riding privilege by cancelling their TAP card. Also, maybe coordinating with County Assistance offices to suspend benefits. No one has a “right” to disrupt service for the rest who are trying to use it. New York City does not have this problem, and neither does DC Metro, Chicago, or any large system. I often ride the Silver Line, Red Line, Orange Line and Green Line. I have never had a problem with someone smelling or sleeping. However, I was accosted by a clean man who vowed to follow me home. It was at the North Hollywood station, and he followed me from the Silver Line down to the turnstiles for the Red Line. He was aggressive. There were no security officers or police in sight. I have also be caught in cars with aggressive, unstable people. These situations are rare, but if you ride regularly, they will occur. All people have the right to use the service. I would just like more security for when things get out of hand. So Steven why are you not running METRO? I did the same for my passengers at Amtrak, but folks would just shake their heads that I was doing more than required. Guess our parents taught us right!